The Central Experimental Farm, commonly known as the Experimental Farm, is an agricultural facility, working farm, and research centre of the Research Branch of Agriculture and Agri-Food Canada. As the name indicates, this farm is located in and now surrounded by the City of Ottawa, Ontario. The 4 square kilometres farm is a National Historic Site of Canada, the CEF original intent was to perform scientific research for improvement in agricultural methods and crops. While such research is still being conducted, the atmosphere of the CEF has become an important place of recreation and education for the residents of Ottawa. Furthermore, over the several other departments and agencies have encroached onto the CEF property, such as Natural Resources Canada, National Defence. The CEF is bordered by the Rideau Canal to the east, Prince of Wales Drive to the South-East, Baseline Road to the south, and Merivale and Fisher Roads to the west, and Carling Avenue to the north. The Victorian era was a time of great interest in the advancement of sciences and many nations built zoos, botanical gardens. The CEF started out with 188 hectares, chosen because of their proximity to Parliament Hill, over the next few years the site was prepared by improving the land, building the facilities, and planting the Arboretum and forest belt. Early research projects focused only on entomology and horticulture, Charles D. Sutherland, Joseph Charles Gustave Brault Thomas Seaton Scott and Thomas Fuller adopted the Neo-Gothic style. David Ewart embraced the Scottish baronial style, in 1887-1888, William John Beckett, a contractor, served as foreman during the building of the residences and barns. In 1889, livestock was introduced to the CEF, Chief Dominion Architect David Ewart designed the Dominion Observatory, Carling Avenue in 1902, Chief Astronomers Residence,1909, and the Geodetic Survey Building,1914. Chief Dominion Architect Edgar Lewis Horwood designed the Cereal and Agrostology Building, 1915-16, Agricultural Building,1915, Chief Dominion Architect Richard Cotsman Wright designed a number of buildings including, the Poultry Office Building,1920, and the Botanical Laboratory Building, 1924–25. Billings Bridge is a bridge over the Rideau River in Ottawa. Bank Street passes over the river by way of this bridge, the bridge was named after Braddish Billings, who settled in this area and established a farm nearby in 1812. The first bridge, originally called Farmers Bridge, was built over the river here in 1830, the current bridge was built in 1916. Billings Bridge referred to a village, located south of the river near the bridge, the area, now an Ottawa neighbourhood, is still referred to as Billings Bridge. In the early XIXth century, the Ottawa area was settled by Europeans. In 1783, a tract of land including what is now Billings Bridge was purchased from the local aboriginal nations as part of the Crawford Purchase. First named in Lunenburg District in 1788, the became part of Township B in 1792. In 1793, the township was renamed Gloucester Township, after Prince William Frederick, Duke of Gloucester and Edinburgh, Billings Bridge was not yet settled in 1800 when Russel County was established and Gloucester Township incorporated into it. 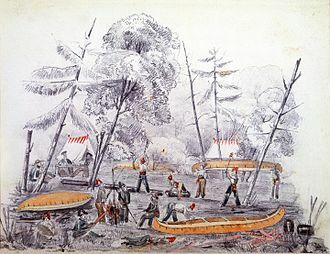 Braddish Billings arrived from Brockville in 1812 and cut out a farm on the Rideau River at the present-day Billings Bridge, the area was widely forested at the time and the early British settlement was focused on subsistence farming, as had Iroquois settlement elsewhere in the Ottawa Valley. The following year he married Lamira Dow of Merrickville and returned with her, Gloucester Township was incorporated in the Ottawa District in 1816. The Billings Bridge area slowly grew with the arrival of settlers, including friends. In 1823, Braddish Billings built a sawmill on a creek running through his property and this creek remains known as Sawmill Creek. Settlement accelerated with the development of Bytown and the Rideau Canal, the first bridge was built by Billings across the Rideau River at Bank Street in 1831. Originally called Farmers Bridge, by 1859 both the bridge and the community commonly known as Billings Bridge. This early bridge was washed out and rebuilt in 1847 and again in 1862, bridges at the time were more vulnerable to this, as they only had a clearance of about 1m above the water level. Canadian Forces Station Carp is a former Canadian military facility located in the rural farming community of Carp, approximately 30 km west of downtown Ottawa. CFS Carp was decommissioned in 1994 and it was not until 1998 that it was reopened as a museum and designated a National Historic Site of Canada. Currently, the facility operates as a museum and is open year-round for tours and these shelters were part of what came to be known as the Continuity of Government plan, which was meant to protect various members of government in the event of a nuclear attack. The original site, some 9.7 km east of Almonte was abandoned when ground water proved impossible to remove, an abandoned gravel pit outside Carp was selected instead, construction began in 1959 and was completed by 1962. The Carp shelter would be the largest of such facilities and the one in the immediate Ottawa area. The underground 4-storey bunker required 32,000 tonnes of concrete and 5,000 tonnes of steel, the structure was capable of withstanding a nuclear blast up to 5 megatons from 1.8 km away. It had massive blast doors at the surface, as well as air filters to prevent radiation infiltration. Underground storage was built for food, fresh water, the bunker was built to accommodate 565 people for up to one month without receiving additional supplies from the outside. It included an emergency broadcast studio for the Canadian Broadcasting Corporation and these facilities were administered by the Royal Canadian Corps of Signals. CFS Carp was decommissioned in 1994 following the reduction in the ICBM threat, from 1959 to 1994, the site was owned and operated by the Government of Canada, Department of National Defence. 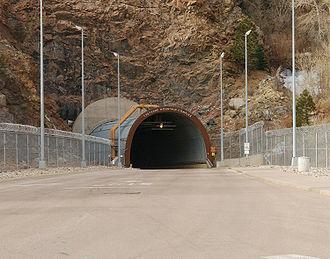 After the local municipality took control of the facility in 1994 and it was purchased by the Diefenbunker Development Group in 1998, and officially opened as a museum. The name of the facility was changed to the Diefenbunker, Canadas Cold War Museum shortly thereafter and it is currently open year-round for public tours. The rest of the 358 rooms have been converted to exhibits of the Cold War era, upon its opening in 1998, the museum was run completely by volunteers. Arnprior is a town in Renfrew County, in the eastern portion of Southern Ontario, Canada. It is located at the confluence of the Madawaska River and the Ottawa River in the Ottawa Valley, Arnprior has experienced significant growth in populations with the widening of the 417 Provincial Highway to four lanes. 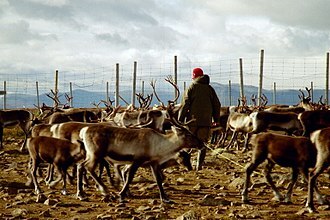 The Town experienced an increase in population by 8. 5% from 2011 to 2016, the town is a namesake of Arnprior, and is known for lumber, hydro power generation, aerospace and its proximity to the National Capital Region. In May 1613 European explorers, led by Samuel de Champlain, first visited the Ottawa River valley, in 1823, a 1, 200-acre surveyed block was ceded to Archibald McNab and given the eponymous name, McNab Township. McNab had approval from the Family Compact to treat the settlers on his land in the feudal manner practiced in Scotland, in 1831 the town was named by the Buchanan Brothers after McNabs ancestral home of Arnprior, Scotland. Tired of the treatment, the settlers revolted and, after a government investigation. Arnprior, Braeside and NcNab township grew as separate communities and boomed when they integrated into eastern Ontarios massive timber industry. The lumber industry maintained a significant position until the closing of the Gillies Mill, one of the most enduring structures of the day was a grist mill built by the Buchanans on the west bank of the Madawaska River. By 1869, Arnprior was an Incorporated Village with a population of 2000 in the Township of McNab and it was on the Brockville and Ottawa Railway at the junction of the Madawaska and Ottawa Rivers. The average price of land $20 to $40, the facility has been bought by Ontario Hydro prior to the restructuring on the bridge and the creation of a new weir to control the river. The building was consumed by fire in 1976, the forests of the period are represented in the Grove which is an excellent example of indigenous forest, grown after a fire in the 18th century. With individual specimens reaching 175 feet, these are the tallest white pines in Ontario, Arnprior was incorporated as a village in 1862. Gatineau, officially Ville de Gatineau, is a city in western Quebec, Canada. 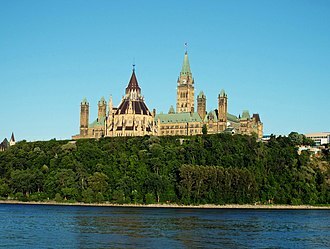 It is the fourth largest city in the province after Montreal, Quebec City and it is located on the northern bank of the Ottawa River, immediately across from Ottawa, together with which it forms Canadas National Capital Region. As of 2011 Gatineau had a population of 265,349, the Ottawa–Gatineau census metropolitan area had a population of 1,236,324. Gatineau is coextensive with an equivalent to a regional county municipality and census division of the same name. It is the seat of the district of Hull. The current city of Gatineau is centred on an area called Hull, Wright brought his family, five other families and twenty-five labourers and a plan to establish an agriculturally based community to what was a mosquito-infested wilderness. 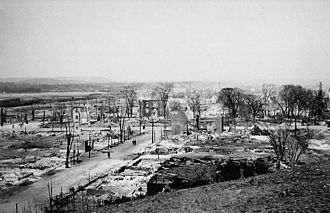 But soon after and his family took advantage of the large lumber stands, the original settlement was called Wrightstown, it became Hull and in 2002, after amalgamation, the City of Gatineau. In 1820, before immigrants from Great Britain arrived in numbers, Hull Township had a population of 707, including 365 men,113 women. Note the discrepancy in the number of men and women, owing to the work of the timber trade. In 1824, there were 106 families and 803 persons, during the rest of the 1820s, the population of Hull doubled, owing to the arrival of Ulster Protestants. By 1851, the population of the County of Ottawa was 11,104, by comparison, Bytown had a population of 7,760 in 1851. By 1861, Ottawa County now had a population of 15,671, the gradual move to the Township by French Canadians continued over the years, with the French Canadians growing from 10% of the population in 1850, to 50% in 1870, and 90% in 1920. The Gatineau River, like the Ottawa River, was much the preserve of the draveurs. 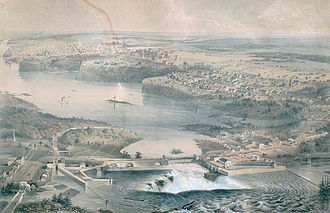 Ottawa was founded later, as the terminus of the Rideau Canal built under the command of Col. John By as part of fortifications and its greater distance from the Canada–US border left the new parliament less vulnerable to foreign attack. 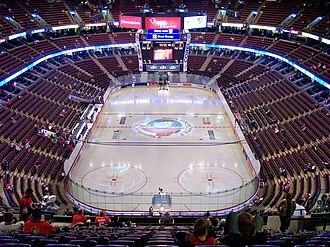 The National Arts Centre is a centre for the performing arts located in Ottawa, between Elgin Street and the Rideau Canal. 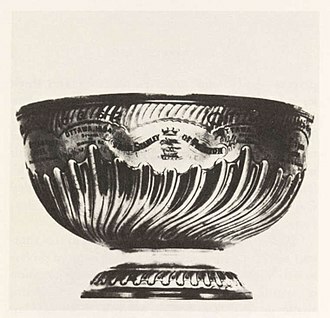 The National Arts Centre was designated a National Historic Site of Canada in 2006, Ottawa did not have a major performing arts venue after 1928 when the Russell Theatre was expropriated and demolished to make way for Confederation Square. Performers and orchestras visiting the capital were required to use the stage of the Capitol Cinema, in 1963, an organization named the National Capital Arts Alliance was founded by G. Hamilton Southam and Levi Pettler. They successfully convinced the city and government to build the new centre, the NAC was one of a number of projects launched by the government of Lester B. Pearson to commemorate Canadas 1967 centenary. It opened its doors to the public for the first time on 31 May 1969 having cost C$46 million to build, the site at one time was home to Ottawa City Hall, and the city donated the land to the federal government. Conductor Jean-Marie Beaudet served as the NACs first music director, in June 2010 a life size bronze statue of the Canadian jazz pianist Oscar Peterson was unveiled outside the NAC by Queen Elizabeth II during her royal tour of Canada. In February 2014, the centre unveiled a new logo and slogan, Canada is our stage, the former logo had been designed by Ernst Roch and was in use since the centres opening. The building, designed by Fred Lebensold, is in the Brutalist style and based on the shape of a triangle, the building is constructed of reinforced concrete. The exterior and many walls are faced with precast concrete panels containing exposed aggregate of crushed brown Laurentian granite. The center rises from a base that sits on a 950-space underground parking garage, the base houses offices, dressing rooms, workshops and a restaurant. The site slopes from Elgin Street to the Rideau Canal allowing for an underground level overlooking the canal. The roof of the forms a multi-level terrace containing gardens that are open to the public. The three main performance spaces rise from the base as a series of hexagonal structures faced with brown precast panels in a variety of textures, windows are tall, narrow slits framed by vertical ribs. The National War Memorial is a tall, granite memorial arch with accreted bronze sculptures in Ottawa, Canada, designed by Vernon March and first dedicated by King George VI in 1939. It now serves as the pre-eminent war memorial of 76 cenotaphs in Canada, in 2000, the Tomb of the Unknown Soldier was added in front of the memorial and symbolizes the sacrifices made by all Canadians who have died or may yet die for their country. The National War Memorial is the point of Confederation Square in Canadas capital city, Ottawa. This locates it between Parliament Hill to the west and the Château Laurier hotel to the east. The memorial, from grade to the tip of the surmounting statues wings, is approximately 21.34 m, with the arch itself 3.05 m wide,2.44 m deep, and 8.03 m high. The lowest step of the pedestal is 15.9 m by 8.08 m, below are the depictions of 22 Canadian servicemen and women from all branches of the forces and other groups engaged in the First World War. At front, to the left, a Lewis gunner, to the right, following these are a pilot in full gear and an air mechanic of the Royal Canadian Air Force, as well as a sailor in the Royal Canadian Navy from HMCS Stadacona. There are three additional infantrymen, all six carry among them respirators and other items of the load carried by every member of the infantry. The figures are moving towards the call of duty atop a pedestal, the dates 1939-1945 and 1950-1953 are on the east and west flanks of the base, while the years 1899-1902 and 2001-2014 are on the east and west arch pier footings, respectively. The Tomb of the Unknown Soldier rests in the surface immediately in front of. Since 1940, the National War Memorial is the site of the national Remembrance Day ceremony, some of these groups place wreaths at the foot of the war memorial. The event is attended by between 25,000 and 45,000 people and is nationally televised, plywood is placed over surrounding flower beds and approximately 6,000 metres of cable is run to connect sound systems and 12 television cameras. Whenever the monarch or another member of the Royal Family is in Ottawa, they will, regardless of the date, the Department of Canadian Heritage and the Department of Veterans Affairs fund summer students at the site, hired to provide site and historical information. In 1991, the Aberdeen Pavilion was in such disrepair that City Council voted to demolish it; the decision was reversed in 1992. Banff Springs Hotel is one of several grand railway hotels built across the country. The Château Frontenac is an early example of a Canadian châteauesque-styled hotel. The style was used for many of Canada's railway hotels. Situated in Downtown Toronto, the Royal York is the largest railway hotel built in Canada. Opened in 1958, the Queen Elizabeth Hotel was the last railway hotel built in Canada. A re-creation of the very limited quarters provided for the Prime Minister. Military restrictions prohibited the Prime Minister from being accompanied by his wife and for this reason John Diefenbaker is rumoured to have refused to ever use the facility. The main conference room inside the Diefenbunker to provide continuity of Canada's government activities that were legal and constitutional in case of a nuclear attack.